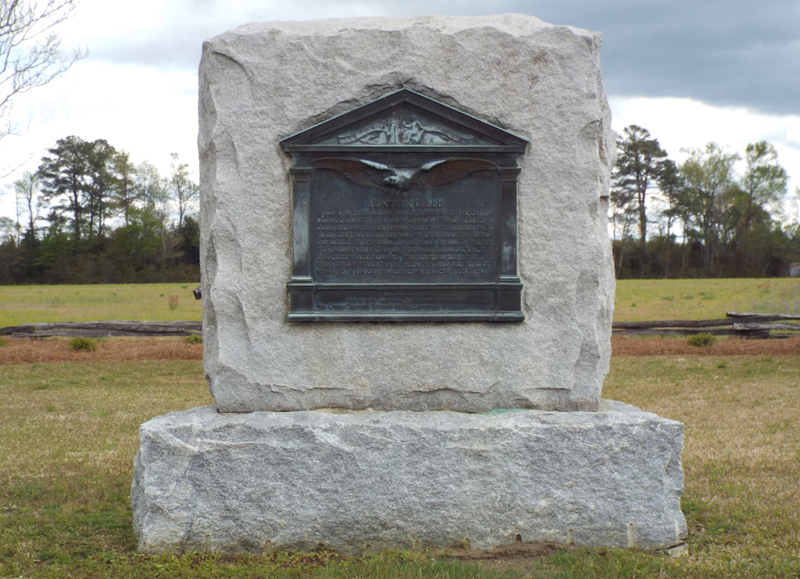 The battlefield marker is a bronze plaque attached to a rough cut granite block on a single base. The plaque was cast as the front elevation of a Greek revival architectural style building. In relief on the building’s pediment are several components from the Great Seal of the State of North Carolina, to include the state motto” Esse quam videri” meaning "To be, rather than to seem". Also prominent are the figures Liberty and Plenty facing towards each other. A bas-relief eagle in flight is directly below the pediment with the inscriptions appearing below the eagle’s spread wings. BENTONVILLE / THIS MEMORIAL MARKS THE BATTLEFIELD OF BENTONVILLE / WHERE ON MARCH 19-21, 1865, GENERAL JOSEPH E. JOHNSTON, / WITH ABOUT 15,000 CONFEDERATE TROOPS, PRINCIPALLY FROM / NORTH CAROLINA, SOUTH CAROLINA, GEORGIA, TENNESSEE, ALABAMA, / AND MISSISSIPPI, CHECKED THE ADVANCE OF MAJOR-GENERAL / W.T. SHERMAN’S ARMY OF UNITED STATES TROOPS UNTIL CONFRONTED / WITH OVERWHELMING NUMBERS. CONSPICUOUS IN THIS BATTLE WERE / THREE REGIMENTS AND ONE BATTALION OF NORTH CAROLINA JUNIOR / RESERVES IN MAJOR-GENERAL ROBERT F. HOKE’S DIVISION. ERECTED 1927 BY / THE NORTH CAROLINA HISTORICAL COMMISSION / AND / THE NORTH CAROLINA DIVISION UNITED DAUGHTERS OF THE CONFEDERACY. After the dedication ceremony a battle reenactment was conducted by the “State Guard” (National Guard) using the entrenchments still visible from the battle. The Great Seal of the State of North Carolina is full of symbolism. Read more about the history of the Great Seal, symbols, figures of Liberty and Plenty in "The Great Seal of the State of North Carolina" by creators of "North Carolina History Project." This plaque design, approved by the state legislature was used over a period of years in memorials associated with the North Carolina Historical Commission. 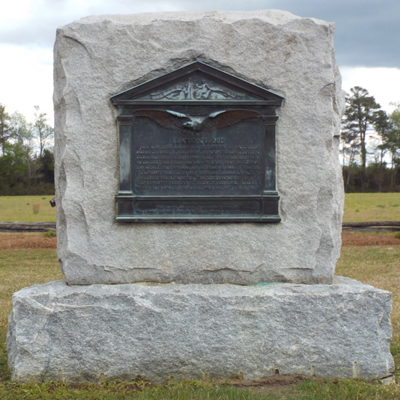 Other examples of the same plaque design are Daniel Boone and Nathanael Greene in Lexington; Arsenal Memorial in Fayetteville, and Richard Caswell Memorial in Kinston. The marker is located at the intersection of Harper House Road and Bass Road as one travels east from the Bentonville Battleground Visitor Center. On the battleground driving tour the marker is located at the Junior Reserves stop. Other memorials at Bentonville Battleground include Texas Soldiers Monument, Union Monument, North Carolina Confederate Soldiers, General Joseph Johnston, Civil War horses, 123rd Regiment New York State Volunteers, and Confederate Monument. The marker is surrounded by farmland, some woodland and scattered housing.